Supraphon has completed its rereleases of Flamengo’s “big beat” classics! In the wake of the reedition of their one and only, not to mention landmark, album Kuře v hodinkách (Chicken in the Watch), it has collated a collection of the band’s previous singles, featuring not only Vladimír Mišík. Three distinct singles penned by Petr Novák – Já budu chodit po špičkách (I Will Tiptoe), Povídej (Talk) and Náhrobní kámen (Gravestone) – need no introduction whatsoever. In addition, the song Džbán (Jug), brought to fame by Novák, is presented here on a recording made with Pavel Sedláček. Yet the most frequently represented soloist is Karel Kahovec, who sings the titular Paní v černém (Lady in Black), Poprava blond holky (Execution of a Blonde), Zavraždil jsem lásku (I’ve Killed Love), as well as John Mayall’s No Reply. The English vocalist Joan Duggan sings Gershwin’s Summertime, while earlier recordings were made by Vladimír Mišík and Ivan Khunt. The rarity bonus is the 1966 recording from the Czech Television archives of the hit Black Is Black, borrowed from the repertoire of the Spanish band Los Bravos and performed by Viktor Sodoma, who in the band’s original line-up shared vocal duties with Petr Novák. The erudite accompanying text was written by Flamengo’s contemporary Jaromír Tůma. While their LP Kuře v hodinkách (recorded 1971-1972) which Supraphon rereleased on LP and CD in 2012 has started to be distributed abroad, it is still quite unknown outside Czechoslovakia that the band was active already during the Sixties. In my opinion they were one of the best Czechoslovakian Beat bands, playing on a similar level as The Matadors. 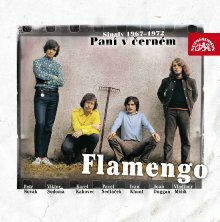 This compilation of Flamengo’s Singles offers a surprising sound: After a start with a few “innocent” compositions the CD offers mainly modern Beat music, partly with fuzz guitars and English lyrics. And the final are a few songs from their progressive phase during the early Seventies.